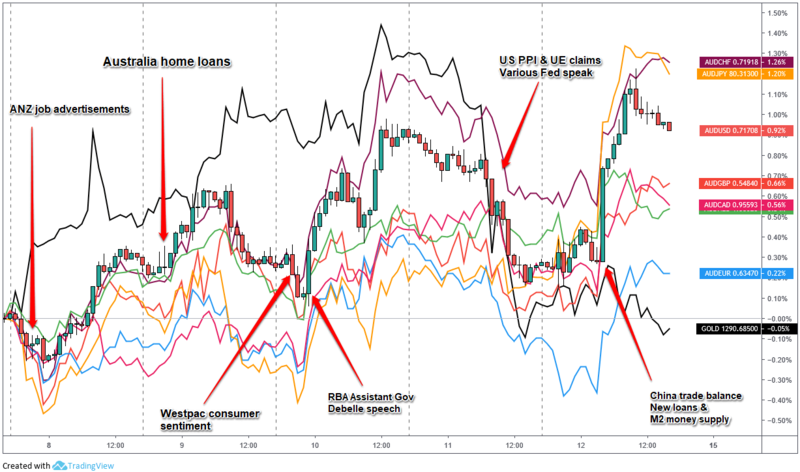 Buyers were ready to jump in on Aussie pairs, even on dips, as Australian & Chinese data improved, on RBA comments, and a general lift from improving risk sentiment. Risk sentiment turn negative to put pressure on Aussie pairs, likely on rising trade tension between the U.S. and EU, and possibly on the IMF cutting the 2019 growth outlook once again. RBA Assistant Governor Guy Debelle’s speech on the State of the Economy – Expectations were for Debelle to sound very dovish in this speech, more so than recent RBA rhetoric. He surprised the markets with very positive comments on the employment situation and inline with RBA rhetoric on Australian housing, global growth and trade tensions, sparking a pop in Aussie pairs. Australia election announced: 10 things to know about the poll – this announcement could have been the spark for broad Aussie selling as traders de-risk ahead of political election risk. It’s also arguable that U.S. dollar strength and gold weakness was likely a contributor to Aussie weakness during U.S. session after positive U.S. unemployment claims, producer prices data, and various Federal Reserve speeches. The end of week rally was likely spurred by the very positive Chinese data, including a big rebound in exports (Dollar-denominated exports rose 14.2 percent for March y/y), as well as a very big increase in new loans and the M2 money supply.